Learn what terms mean something important, and which are just marketing-speak to make you part with your hard-earned cash. It’s a familiar scenario: You’re at the grocery store. You’re trying to be an eco-conscious consumer who also cares about animal welfare, so you’re reading all the labels on all your groceries. But as more and more information continues to show up on food labels, pretty soon you have an alphabet soup of terminology that sounds good—even if you don’t know exactly what it means. It’s been a long day, so you quickly toss the item in question into your basket without actually knowing WTF “Certified Humane Raised and Handled” entails, and head to the checkout. Feeling like your efforts are kind of half-assed? 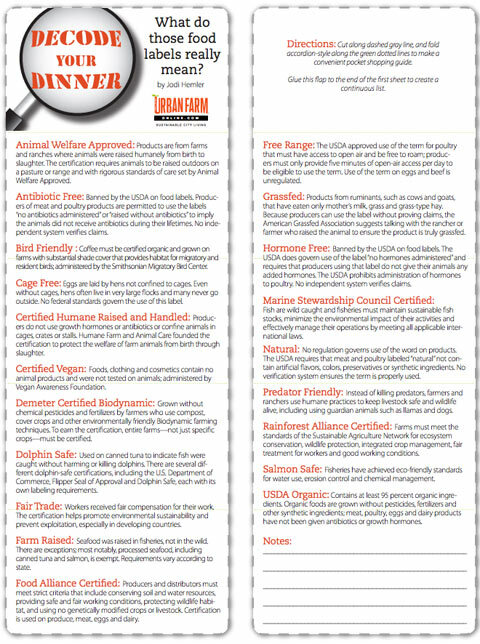 Urban Farm Online is here to help you, by spelling out exactly what those food labels and certifications mean. By printing out the above cheat sheet (PDF) and sticking it in your wallet, you’re well equipped to answer any questions about food labels next time you’re at the store. One note: UFO‘s definition of “USDA Organic” is slightly oversimplified. Their definition does mention that certified items must contain 95 percent organic components. However, one common myth about organic produce is that it’s grown completely without pesticides. As the Washington Post points out, that’s not completely true. For one, there are approximately 200 non-organic substances that are allowed to be added to your food according to current regulations. Not only that, but the other 5% of your certified USDA Organic produce might have been sprayed with herbicides or pesticides—botanically-derived or not. It’s also worth noting that if what you’re buying includes ingredients sourced outside the U.S., different countries have different definitions of “Organic,” and may not necessarily meet U.S. standards. That doesn’t necessarily mean they’re worse, but it’s worth thinking about. Also, WaPo mentions that the inspection process for items that are certified organic is fraught with problems, conflicts of interest, and inconsistencies—so it’s far from being perfect, or even all-encompassing. Still, if you’re a concerned consumer who wants to watch out for the environment, animals, and what you’re feeding yourself and people you care about, this guide could be a good starting point for more questions, as well as a good crib sheet.